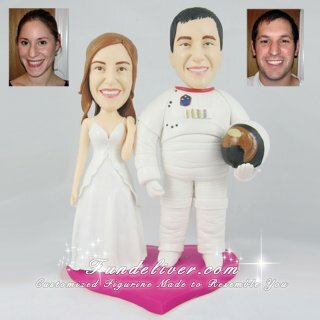 This is a completely customized astronaut and space theme wedding cake topper. The groom figurine is in a space suit without extravehicular mobility unit, holding his helmet which is for containing breathing gases. The space activity suit is sculpted based on Apollo/Skylab A7L EVA and moon suit, Advance Crew Escape System Pressure Suit. The bride wears her delicate dress. Both figurines are standing on a red heart shape base.